Trump Whines: Media Meanies Hate My Tax Scam - Joe.My.God. President Trump lashed out at the news media on Wednesday for what he said was demeaning coverage of Republicans’ tax code overhaul. 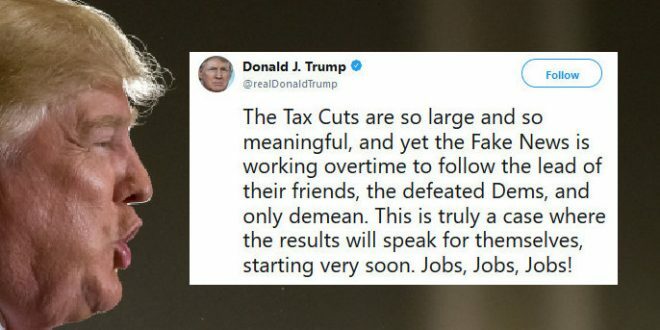 Trump’s tweet came after the Senate approved a sweeping rewrite of the nation’s tax code in a party-line vote early Wednesday. The House, which passed the measure on Tuesday, is set to vote again later Wednesday after a few last-minute changes in the Senate-approved bill. 1. “Defeated Dems”? Democrats aren’t some enemy military that lost a war, they’re one of the two major political parties in your country. 2. You do realize that job creation is not like Beetlejuice, you don’t just say it three times and they magically appear.